One of the highlights of our time in Canada was a sunset photo tour we took with David McColm to the top of Whistler mountain. I cannot recommend this tour enough! 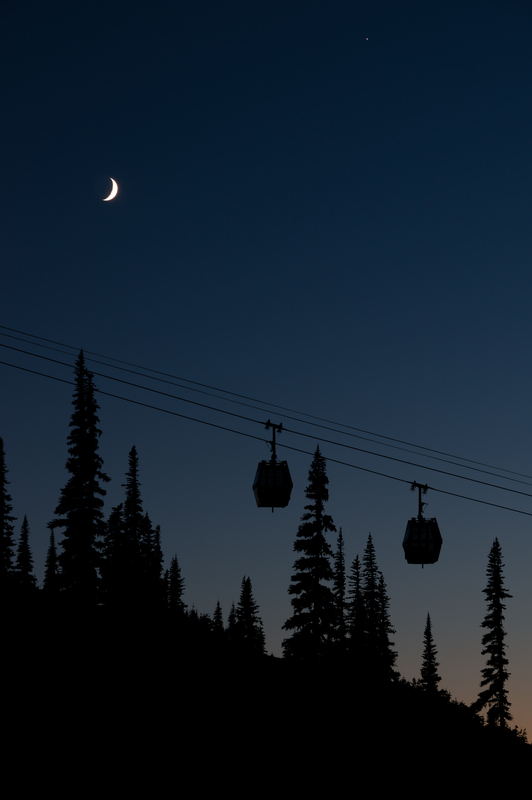 Coming back down the mountain after dark we spotted these gondolas silhouetted perfectly against the moonlit sky. I’m sure our time was pretty much up by this point, but we still spent what must have been at least 20 minutes working this scene from the side of the road. That 20 minutes was probably the most fun I have ever had with my camera! It was fantastic to share the experience with another passionate landscape photographer. That small light to the right of the moon is Jupiter, and just out of shot was Saturn also shining bright. Unfortunately we missed the aurora borealis by one night, but I can’t think of a much better to reason to go back! David’s time lapse work from Whistler is out of this world, and if you’re interested in taking a tour you can book through the Whistler Blackcomb website. David has no idea that I’ve mentioned his tour in this post, I simply had a brilliant time! This entry was posted in Canada and tagged Canada, Gondolas, landscape photography, Moon, mountains, night photography, Silhouette, Whistler on July 28, 2015 by Ben. I’d seen so many images of Moraine Lake before visiting for myself that I had a good idea of the well-known photo spots. After making the most of my research I decided to head further around the lake to try and find a different angle. This shot was taken at sunset as the last rays of sunlight fell on the ten peaks that tower over the water. I was overly paranoid about bear encounters during our time in Canada, and sightings have been on the rise in this area of the park during recent years. So each time I went out into the trees I’d sing to myself to make sure I didn’t take any by surprise. As I took this photo crouched low to the ground with my tripod, I was singing to myself and looking over my shoulder every 30 seconds whenever I heard something in the bushes. I’m sure I was never in any danger at all, but as soon as the last light was gone I rushed back to the hotel very quickly! 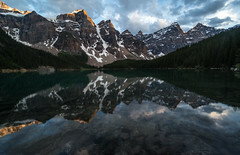 This entry was posted in Canada and tagged Alberta, Banff National Park, Canada, Lake, landscape photography, Moraine Lake, mountains, Reflection on July 20, 2015 by Ben. I wish I’d known about this little red lodge before our trip to Canada! Just by Bow Lake it must be the perfect place to stay for a couple of nights in Banff National Park. This was our third stop along the Icefields Parkway and we still had so much more to explore. Unfortunately it was pretty windy and the water was very unsettled. I didn’t have a tripod with me for a long exposure so I decided to focus on taking longer shots of the surrounding mountains to avoid having too much unwanted texture at the bottom of the image. I’m not sure why but I never like that in photos! Just before we set off we heard another group shouting – “Look, a bear!” – and just a few metres away from us was a black bear right by the parking area! Equal parts terrified and excited, we moved away slowly to continue our journey along the Icefields Parkway. Have you ever seen a bear? Where’s the best place you’ve been for wildlife spotting? Maybe you know something about this lodge?! Please get in touch! 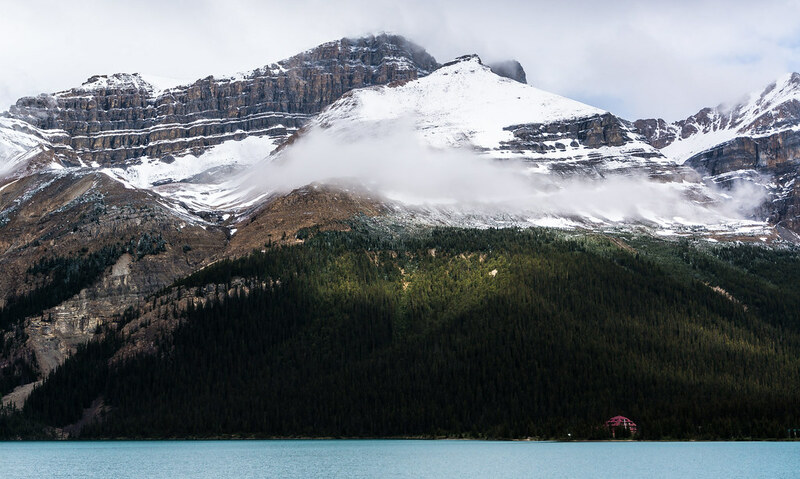 This entry was posted in Canada and tagged Alberta, Banff National Park, Bow Lake, Canada, icefields parkway, Landscape, landscape photography, mountains, Red on July 15, 2015 by Ben. Respect for the environment and preservation of its natural beauty was clearly evident throughout our time in Banff National Park. Vistas like this, an endless sea of trees with not a road or mountain chalet in sight were all around us as we made our way along the Icefields Parkway. It’s a huge contrast to what I see here in the French and Swiss Alps, with many mountains scarred by switchbacks, clearings for ski slopes and holiday homes. I certainly know which I prefer – I’ll take raw and inaccessible over inhabited and well-travelled every time! The untouched nature of the landscape also made it much easier to take uncluttered photos, and we stopped at almost every opportunity between Banff and Jasper. How anybody can drive past a view like this without stopping for a few moments I will never understand! What’s the most untouched place you’ve ever visited? How did it make you feel? Could you drive on past a view like this?! I’d love to hear from you! 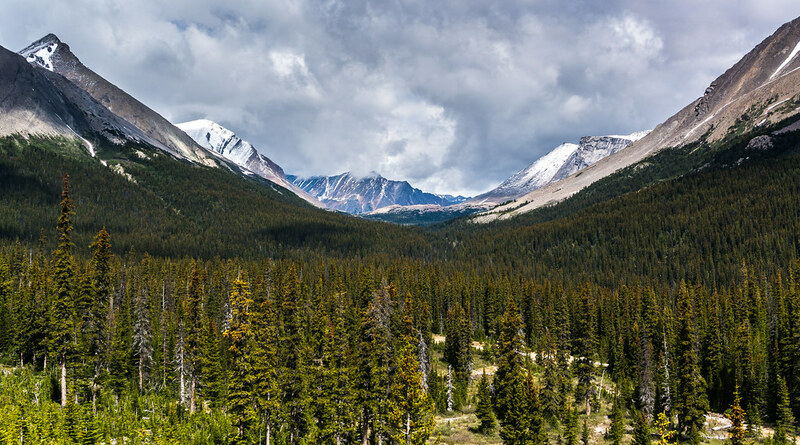 This entry was posted in Canada, North America and tagged Banff National Park, Canada, icefields parkway, Landscape, landscape photography, mountains, Trees on July 8, 2015 by Ben. Apologies for the radio silence over the last couple of weeks! But I’ve been fortunate enough to spend them travelling around Canada. What an awe-inspiring place for landscape photography – I took so many photos! And I’m so excited to start sharing them with you over the coming weeks. Our first stop driving the famous Icefields Parkway through the Canadian Rockies was Herbert Lake. The overcast skies that had left us slightly disappointed as we started our journey created an incredible atmosphere over the water and to the mountains beyond. The clouds were moving at a pace and seemed to create a completely different view each time I looked out, hiding and revealing the peaks as they went. I took many wider shots but felt that the isolation of this single mountain face by the cloud created a more focused scene. I brightened the image up a bit and boosted the contrast to try and give a more mystical, fantasy feel to the image which is exactly how I felt standing in that spot. It was the perfect start to what must be one of the greatest scenic drives on our planet. 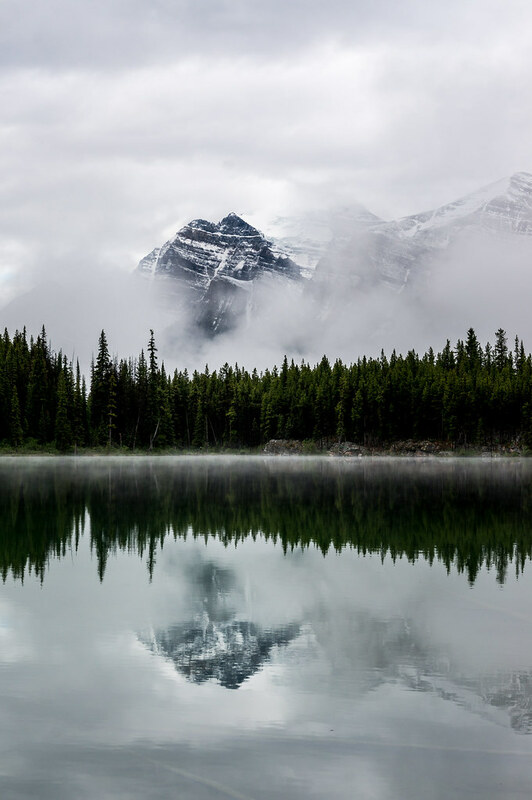 This entry was posted in Canada, North America and tagged Canada, Cloud, herbert lake, icefields parkway, landscape photography, mountains, Photography, Reflection, rockies, Travel on June 29, 2015 by Ben. For our last night on Hawaii’s Big Island we stayed on the Kona coast, and just like so many other nights in Hawaii it offered up a fantastic sunset. Despite the signs warning people away I spent a while exploring the rocks outside the Sheraton hotel looking for some interesting foreground to shoot. The boat you can see out to the right is not there for the sunset, but to serve as a base for people snorkelling and scuba diving to see the Manta Rays that are very common in this part of the world. Unfortunately we didn’t have a chance to experience it this time around. The Manta Rays have been ‘trained’ to associate light with plankton, so after dark they are attracted to the torches that tour guides shine under the water. I just need to become a certified diver so that I can get down there and take some photos! 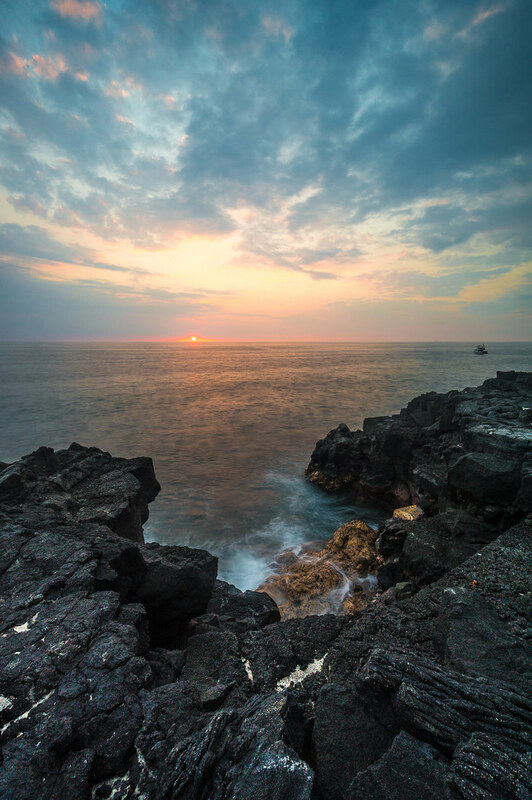 This entry was posted in Hawaii, USA and tagged Coast, hawaii, Kona, landscape photography, Ocean, Sea, sunset, usa on June 8, 2015 by Ben. I just couldn’t escape the clouds during my time in Hong Kong, they were everywhere! And while it would have been nice to see some sunshine, they did at least provide a dramatic backdrop for some photography at the Chi Lin Nunnery. I spent a good while in this spot waiting for the best moment to get a shot without many people in. Almost every time I was about to click the shutter another large group would enter through the front door! So I would just sigh and wait another few minutes for them to wander through. Eventually it all came together, and I even managed to keep my camera straight whilst rushing for the shot! This was the most peaceful place I visited in the city of Hong Kong, the striking contrast to the cityscape behind impossible to ignore. 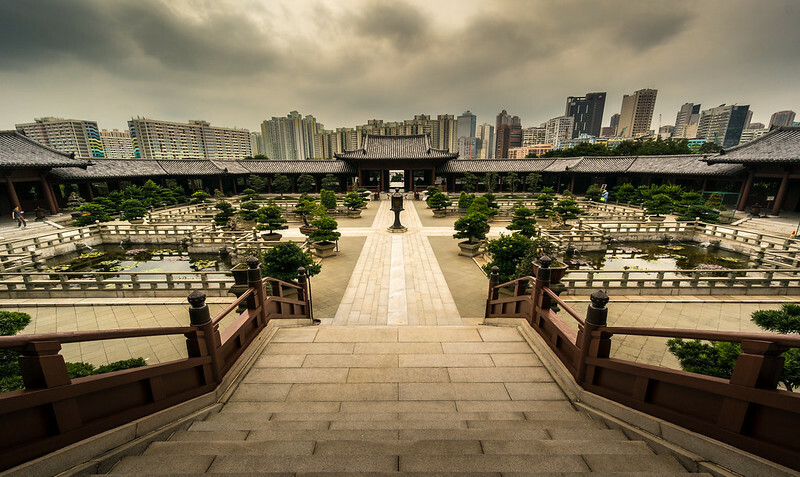 This entry was posted in Asia, China and tagged architecture, Architecture Photography, Asia, buddhist, Chi Lin Nunnery, China, clouds, Hong Kong, temple, travel photography on June 1, 2015 by Ben.